For use with our 1.5 inch diameter Uprights only (and please note that this item is not compatible with our DuraTop Upright upgrade). 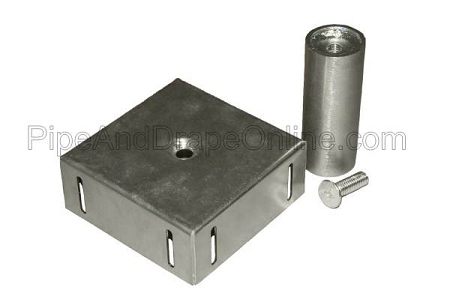 This will not work with 2 inch Diameter Uprights (please see our 2 inch version of this item). The metal was not strong enough and bent when we tested it. The structure we were designing was a square with drapery and flowers. The backwall hanger kept twisting when we were placing the fabric on the poles and bent. I would not recommend it and we will not be using it for our project. Reply from PipeAndDrapeOnline.com: Thank you very much for your feedback, and I'm sorry to hear that this item didn't work as expected. 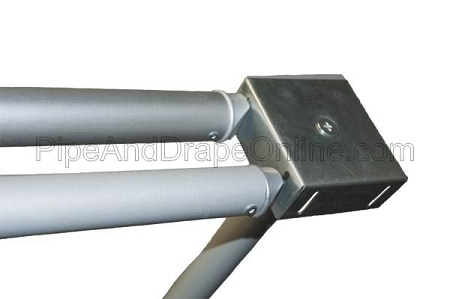 These Double Backwall Hangers are made of steel, so they should be durable enough to not bend during use. If you get a chance, please contact us when it is convenient for you so that we can better understand the application, and provide any troubleshooting tips that may help. Thank you again for taking the time to give us your input! Great product. Shipped fast and in good condition. I would recomand it to my friends. Q: I'm planning to buy the 8 FT TALL (FIXED) X 10 FT WIDE FRAMEWORK can I add this hanger on that framework ? apart from these two I guess i need to buy the ADJUSTABLE WIDTH SUPPORT ROD right ? A: Absolutely, this item will work with our 8x10 Framework Package. You'd just want to make sure that you purchase a quantity of 2 of these Double Backwall Hangers (or if you're purchasing multiple kits, you'll need one of these for each Upright that is being used in your double layer set-up). And you are correct, the Framework Kit includes a Support Rod / Crossbar, but you'll need to add another crossbar that will be used for the 2nd layer of drapes that you are creating with this item. Q: Are these able to fit all universal pipe a drapes? Weight (Approximate, Each): 1 lb. 2 oz.